The Triangle real estate market has remained strong through 2017, and overall home values and home sales have steadily climbed since 2010. We have seen relatively low days-on-market this year, with the exception of the luxury market in which DOM for pending homes averaged 65 days July 2017. Most would argue even 65 DOM is still very low, but the number is much lower for homes under $500,000. Sales in Wake County were down 4.35% in July ’17 vs July ’16. However, while sales were down, sales prices were up over 5% which is great for those who sold their homes this summer. Durham County had the highest percentage increase in number of sales in July, up 7.46% from last year. Sales prices in Durham also rose a whopping 11%, proving Durham’s market to be very strong amongst the Triangle markets. 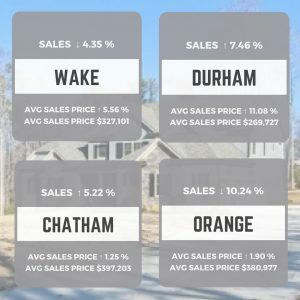 Chatham County has steadily increased in number of sales and average sales price over the past year, and with Chatham Park under way, this is a trend we can expect to continue for years to come. Orange County again showed a decrease in sales, in July ’17 sales were down 10%. Sales prices rose slightly-the average sales price held strong at $380,977. Information courtesy of Triangle Area Residential Realty Report August 2017.